Agra is known for its Taj Mahal and Taj Mahal gets its beauty with the first ray of sun as soon as the sun rises and the marble of the Taj shines with the rays. With this Same Day Agra tour package, Witness the spellbinding view of Taj Mahal at the Sunrise. Meet our representative and get yourself picked from hotel/Airport/Railway station and proceed for your journey to Agra. 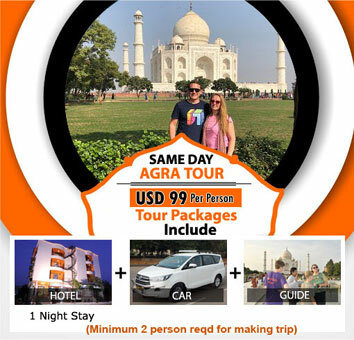 As this Same Day Agra tour makes you witness the sunrise view of Taj Mahal, you would have to embark on your journey at midnight around 2.30am. As you reach Agra by the early morning, proceed to enjoy the sunrise view of the Taj Mahal. Later opt for breakfast at hotel or restaurant and post you are done with it, proceed for a sightseeing tour of Agra that includes the visit to the Agra Fort, which is a massive fort built by the Mughal Emperor Akbar. Followed by a visit to the Baby Taj, initially the Tomb of Itmad-ud-Daula. As it considered being the Jewel Box, one can be totally spellbound because of its magnificent architecture. Visit the Charbagh Complex of the Taj Mahal also known as the Mahtab Bagh. Later drive back to Delhi in your private car.